Any time a band lists Dragged into Sunlight and Yob as main influences then you know that you're in for something special. Yet, unlike many of the other bands who are affected by those groups they make some searing doom death metal filled with a rage that could stun an elephant. Frenzied and destructive this is not for kids who just want something to groove to. No, the atonal music of Horse Head is often difficult to latch on too and the growls have a certain inhuman ferocity behind them that only makes everything tastier. 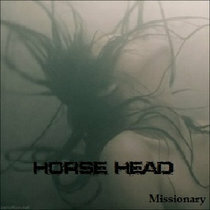 Maybe this won't appeal to everyone, but the select few who do dig death metal that is as extreme and hectic as Horse Head will find catharsis in their new EP, Missionary. I get the impression that Horse Head are going to be taking some huge steps forward over the next year and I really hope that I get to see them evolve. Not a lot of debut EP's from unsigned bands impress me this much. There is something greater, something more powerful to the Horse Head sound that drives them beyond what many of their contemporaries are capable of, and this is what will ultimately grant them death metal glory.